In short, you could say that biometric screening is a 15-20 minute health screening that could have life-changing—and even life-saving—results. With a few measurements and a simple prick of the finger, a biometric screening—is produced, providing vital information regarding an individual’s risk for certain diseases and conditions. Biometric screenings are just one of the ways we at Balanced Wellness strive to create a healthier, more informed, and balanced society. With over 30 years of experience in the wellness industry, our goal is to provide comprehensive, yet cost-effective and easy to understand, health and wellness programs. Biometric screenings are an integral part of this effort. The results of these screenings help us determine the overall health of a company, and provide us with objective measurements, from which we can create a comprehensive program and closely measure its efficacy. This helps us not only improve corporate wellness, but it also pushes us closer to our goal of helping each individual achieve and maintain their optimal wellness. 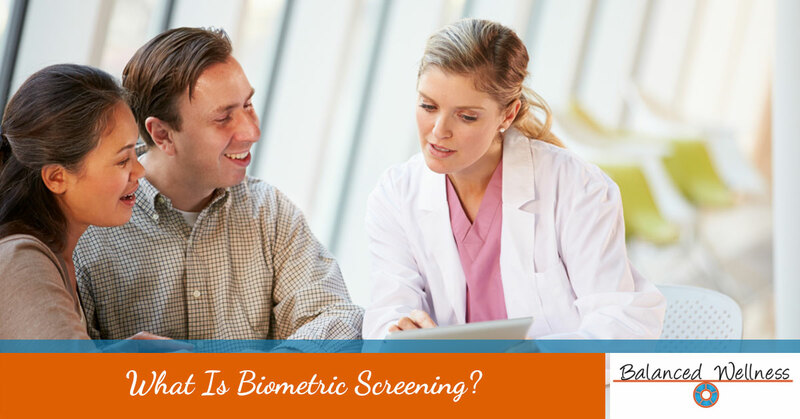 Still unsure what biometric screening entails? Read on to find out more. Heart disease, diabetes, and obesity are among the greatest killers in America. What’s most troubling about this statistic is that susceptibility to these conditions can be greatly reduced through dietary and lifestyle changes. This is why it’s important to pinpoint and build awareness around indicating factors. The following measurements are taken because of their effectiveness in predicting diabetes, heart disease, and obesity. More and more companies and organization are wisely placing a high premium on the health of their workforce. As a result of this, wellness programs and health coaching are becoming essential parts of the workplace, resulting in better overall health, increased productivity, and often a decline—or plateau—in healthcare costs. Customizable, On-site Screening – From promotion to setup, our biometric screenings are flexible and can be tailored to your needs and liking. We work with all types of groups, employees, and organizations, making our biometric screening perfect for private and public settings. Flexible Data Reporting – We tailor our screenings to meet your needs. Whether you want to use the data to develop a comprehensive incentive-based program or simply get an overall assessment of your employees’ health, Balanced Wellness can report the data the way you want and need it. Integration-Ready Results – The results from biometric screenings are the perfect foundation for a workplace wellness program. The results can easily be integrated into an incentive based program or virtually any type of health and wellness program. The data also serves as a great benchmark for measuring program efficacy. Highly Qualified Staff – On top of being trained and certified to conduct and educate on biometric screenings, our staff is wholeheartedly committed to helping individuals find their ultimate well being and improve work life balance. The solution for better health is more or less the same everywhere—eat better, exercise more, and maintain a healthy lifestyle. However, this is well understood and isn’t the thing that is preventing people from achieving their optimal well-being. To truly be spurred into action, people often need an individualized assessment that lays out data-driven risks and presents a realistic and actionable plan. Biometric screenings can be the perfect catalyst for bringing about this change. By offering biometric screenings to your community and workplace groups, you can help yourself and your peers achieve and maintain optimal well-being. Contact Balanced Wellness to learn more about biometric screenings as well as our other health and wellness programs!